Once you have your motor selected and in-hand, you need some way to physically mount the motor where you need it to go in the motorcycle. To do this build an “Adapter Plate” or “Motor Mounting Plate”. I built mine from a piece of scrap 1/4″ aluminum plate that I had around. 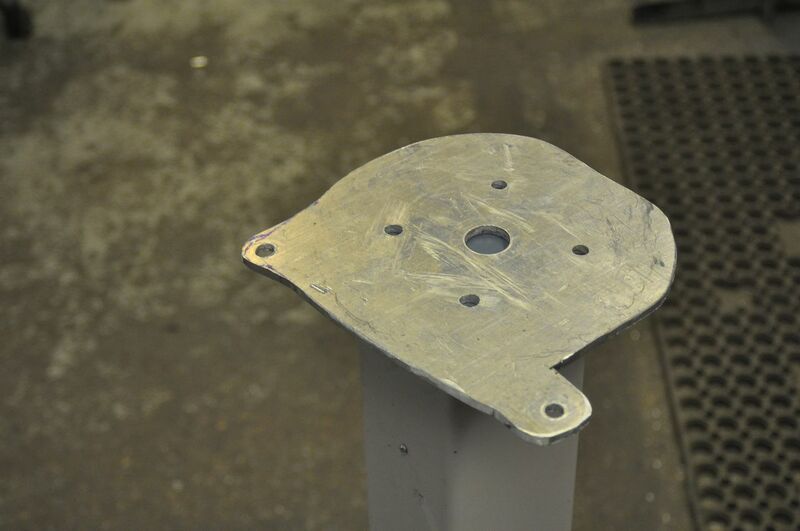 The plate needs to have a hole in the middle of it for the driveshaft to pass through and four holes in the appropriate locations for the bolts to mount the motor to the plate. 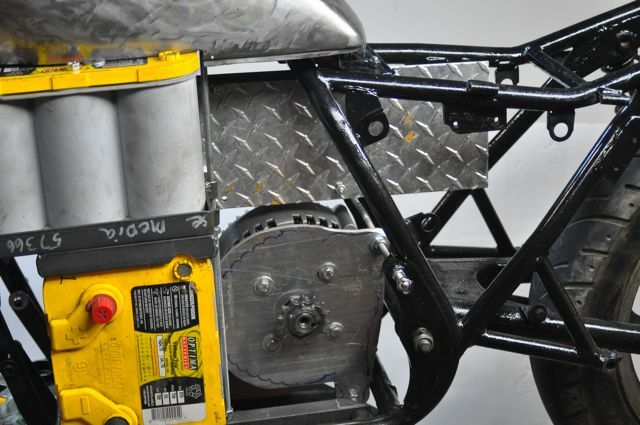 The plate also needs mounting points to connect it to the frame of the motorcycle. On this project, I re-used the existing mounting points in the frame of the cycle where the engine and transmission originally bolted in place. Those holes are already just about where I needed them and it meant I didn’t have to make any new holes in the frame. 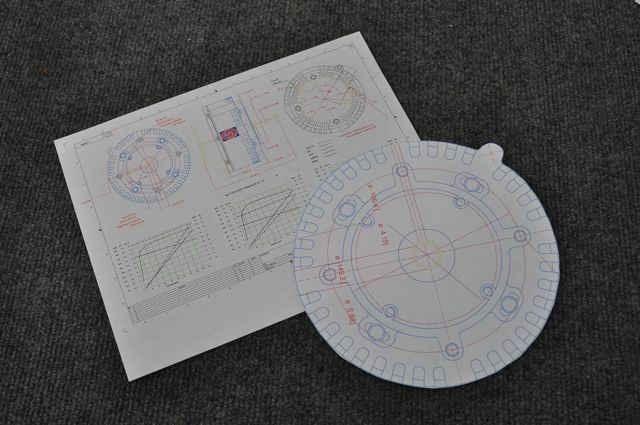 Rather than making a template from scratch, or drilling holes based on careful measurements of the motor, I simply made my own paper template based on the PDF file that I already had of the mechanical drawing of the motor. In a graphic design program, I simply made sure that the measurements on the diagram matched up to 100% actual scale, and printed it out on paper. The motor is compact enough that the whole image fit on one 8.5×11″ sheet. I cut out the piece of paper and then glued it (rubber cement) to the aluminum plate. 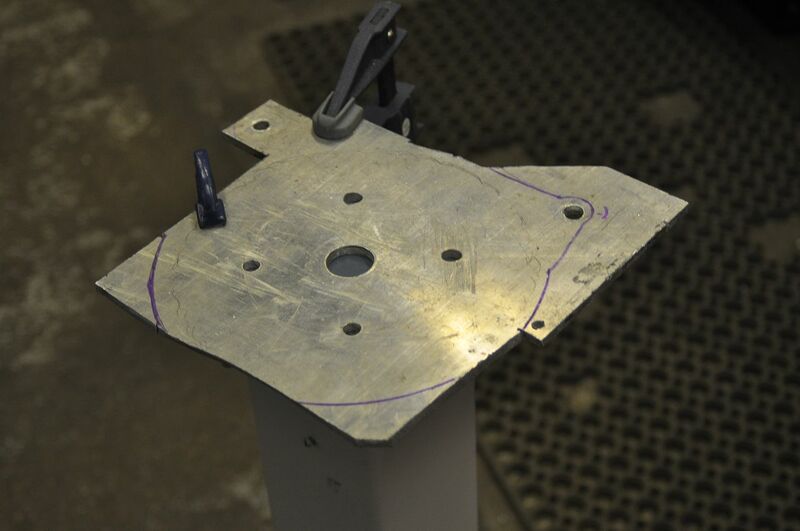 Using a drill press, I simply drilled holes of the appropriate size (the size is marked right on the diagram!) right through the crosshairs on the piece of paper. That gave me a plate of aluminum with a central hole for the driveshaft, and four holes to mount the motor to the plate. I test-fit the plate in place on the motorcycle, with the drive-shaft hole lining up with the marks on the frame indicating where the chain originally went. I then sketched right on the plate “tabs” of where the plate would extend to the existing mounting points on the frame – one on the bottom and one on the high side of the back. I will later add another attachment point on the front with an angle bracket. At that point, I could just put the motor and plate together to confirm that all the holes lined up. I also traced the outline of the motor on the plate. Once I rounded off all the edges, I put the plate in the motorcycle, and ran threaded rods (3/8″ and 5/16″, which matched the holes in the frame) through the frame attachment points, through the plate, and through the matching attachment point. Stainless steel nylock nuts and washers went on both sides of the adapter plate and on the outsides of the motorcycle frame. If I ever need to adjust the position of the motor side-to-side, I can loosen the nuts on either side of the plate and move it one direction or the other. this is amazing and also am going to build my own electric vehicles and i had doubt, am thinking of doing generator for the power resource of electric vehicle.we don’t need to put charge or need to find whether charge is there in a vehicle or not…is that good finding a generator on the same vehicles using another motor? Hybrids are at least one step more complicated than a plain electric vehicle. For a motorcycle, perhaps the best way to do it would be to convert the cycle to electric, and then later build a sidecar or trailer with a generator unit in it for those long trips! I am a student at UW, and am starting my own motorcycle conversion. I was bummed that I missed you at the green expo here in Madison, but was wondering if I could ask you a few questions sometime. I have some experience, but could use guidance on some finer details. I don’t know how you prefer to be contacted, here or through emails, but I could not seem to find your email address, so I figured I would just ask you for it here. I’ll give you an e-mail. I’d love to help on your project. You talked about AC motor. Is it 110v and is it available and where? There are a few designed to run on lower voltages for golf-cart and forklift use, but those tend to be less powerful. Hi Ben can i use 12 volt battery and which type of DC motor i used for it. which provide range of 60-80 km when battery full charge. Yes, you COULD use a single 12V battery, but you wouldn’t want to. It will provide neither the speed or range you want for an electric motorcycle. I notice there are 8 mounting bolt holes, but you only used 4. 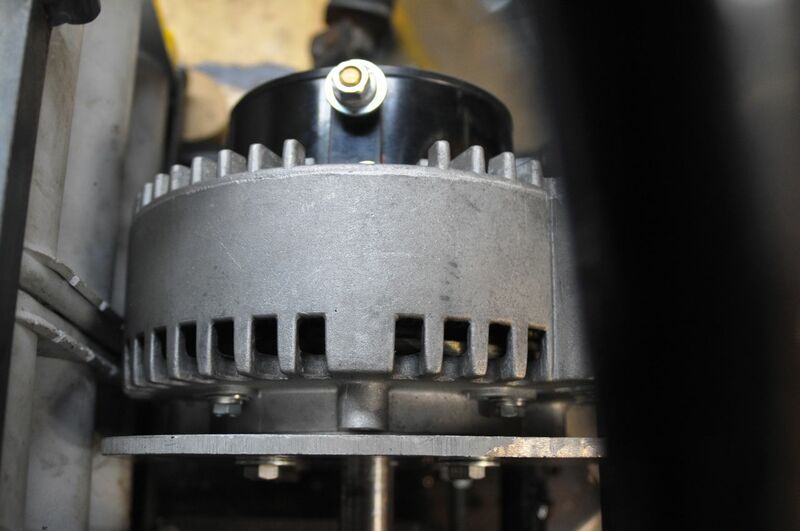 Do you know if this is how the motor was intended to be mounted? It looks like the inner and outer bolt holes are on different planes, separated by 3.2mm. I’m trying to figure out if I need to build a fancy mounting plate that can accommodate these different planes, or if I only need to use 4 of the holes. Mounting it with 4-bolts is fine. Just make sure to torque them down and use lock-washers or Threadlock. The other set of bolt holes is on a different plane than the first. You would use that if your mounting plate had a nice large hole in the middle of it to fit part of the motor through. Otherwise, your motor would not be all the way up against the mounting plate.